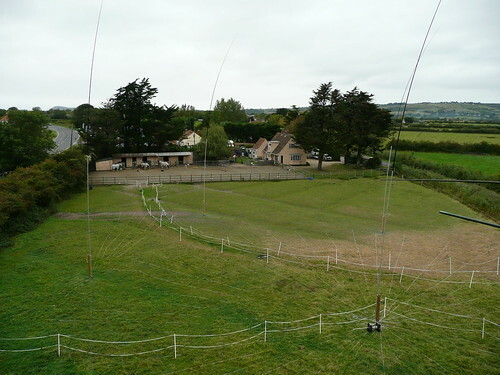 The weekend has passed and the bands have returned to there normal less busy state, after they we’re took over for 48hrs for the yearly CQWW SSB contest, this year I took the trip down to G6PZ in Weston-Super-Mare on the south west coast of the UK. I arrived at the station Friday afternoon, and we were soon out in the field doing some finishing touches on the 4 square that Paul (G6PZ) had been working on over the last couple of weeks, and cranked up the MonstIR to its full height I can tell you that’s no easy job! The contest started and didn’t seem to easy going and we found it hard getting any large NA runs on 40m due to lots of QRM, but non the less a steady stream of QSOs where being worked and 80m was near enough the same but picked up slightly at sun rise. During the day we were pleased to see that 15/10m opened up giving us some much needed QSOs and Mults, we spend some time on these bands then moved to 20m later on in the day. During the day we also finished building the quarter wave 160m vertical and laid some much needed radials. Sunday conditions seemed very much the same, with 15/10m being full of stations during the daytime and during the final hour of the contest 160m gave us a good run of North American stations, and with the new 4sq on 80m it certainly made made us feel loud. Overall a very enjoyable weekend contesting and socialising with the team! I’m looking forward to the next contest already. Great posting and thank you for taking photographs as well. I’m wondering about the 1/4 wave 160m vertical and how many radials are underneath it? Are they cut at 1/4 waves? I’m reading a series of QEX articles written about shortened radial systems cut at an 1/8th wave instead of a quarter. His results are interesting and counter intuitive. I’m thinking about applying his findings in the antenna lab. I’m moving away from antenna farm, antenna patch, and/or antenna garden and using the term, antenna lab, it sounds 21st Century. There was about 30 radials under it.. each at around 30metres in length.